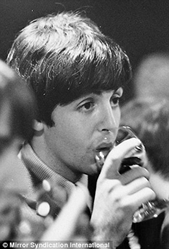 Paul McCartney, 76, reveals he only has one glass of wine a week . Beatles Radio: The Beatles, Solos, Covers, Birthdays, News The Fab 4 and More! He smoked marijuana on and off for four decades and turned to whisky to cope with the stress of the Beatles breaking up. But Sir Paul McCartney has revealed his wild days are over as he has transformed his lifestyle and now only drinks one glass of wine per week. He credits his eight grandchildren for keeping him on the straight and narrow as he simply doesn't have time to enjoy raucous nights out any more. Lyrics on Sir Paul's new album, Egypt Station, refer to his bad old habits during the height of his fame as a Beatle.